Canadians are about to get their first taste of a smart home powered by Google. Because Google Home is now available to buy in Canada. This means Google is beating Amazon to the True North, with the online retailer still not considering Canada worthy of its Echo line of smart speakers Amazon Echo vs. Dot vs. Tap: What Are the Key Differences? Amazon Echo vs. Dot vs. Tap: What Are the Key Differences? One common complaint against Amazon Echo was that it had too many features and cost too much. Amazon's response to that? Releasing two variations with smaller price tags: the Tap and the Echo Dot. Read More . Amazon launched the Echo in the U.S. in June 2015. Google followed Amazon’s lead by launching Home in November 2016. Amazon then focused on developing a whole line of devices, including the Echo Look The Amazon Echo Look Gives You Fashion Advice The Amazon Echo Look Gives You Fashion Advice The Amazon Echo Look is a hands-free camera designed to dole out fashion advice to those who need it. Useful? Possibly. Niche? Probably. Narcissistic? Definitely. Read More and the Echo Show Amazon's New Echo Speaker Comes With a Touchscreen Amazon's New Echo Speaker Comes With a Touchscreen Amazon has unveiled the Echo Show, an Alexa-enabled speaker with a touchscreen built into it. As useful as this may be, it looks like it belongs in the 1980s. Read More . But Google focused on launching its one and only smart home device in more countries around the world. Now, newly including Canada. For the uninitiated, Google Home Google Home Review Google Home Review Google Home is a personal assistant smart speaker, and comes from a company that literally knows everything. The $130 Google device answers questions, controls your smart home, and plays music. Should you buy one? 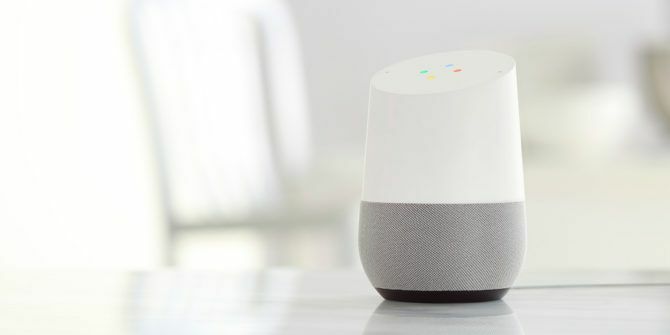 Read More is Google’s own take on the smart home speaker. It sits in your house, ready to do your bidding when you issue voice instructions. Google Home can answer questions, inform you about the weather, play music from Spotify, and much more besides. Canadians can now preorder Google’s smart home speaker from Google’s online store or Best Buy. Google itself is suggesting a vague release date of “2-3 weeks”. However, Best Buy suggests Google Home will arrive in Canadian stores on June 26. So we’ll assume that date is correct. Google Home will set Canadian buyers back $179 CAD. Which puts it on a par with the U.S, price. If you preorder, Best Buy will throw in a Chromecast for free. However, Google Home will also be available from Bell, Indigo, London Drugs, Rogers, Telus, Staples, The Source, and Walmart. Google is taking an aggressive approach to getting Home in as many homes as possible. So, as well as Canada, the company is launching its smart speaker in Australia, France, Germany, and Japan this summer. Thus capitalizing on Amazon’s lackadaisical launch speed with the Echo Amazon Echo Review and Giveaway Amazon Echo Review and Giveaway Amazon’s Echo offers a unique integration between voice recognition, personal assistant, home automation controls, and audio playback features for $179.99. Does the Echo break into new ground or can you do better elsewhere? Read More . Do you already a Google Home speaker? Would you recommend it to our Canadian readers? If you’re Canadian, have you been hankering to buy Google Home? Or are you going to hold out for the Amazon Echo or the Apple HomePod? Please let us know in the comments below! Explore more about: Amazon Echo, Google Assistant, Google Home. We have had our Alexa for 2 years but are looking to upgrade to the Google system due to lack of support here in Vancouver for the Alexa. We cannot get any local information because the Alexa is not supported in Canada. Very frustrating. We've got 6 Echo Dots (purchased in the U.S.) throughout the house for a couple of months now. It does have some limited functionality outside of the U.S. but we mostly use it for home automation stuff and for fun. Nothing like asking the 'Computer' to turn on certain lights or the T.V. (via Harmony Hub) or to ask it to look up who won Superbowl 24 during a heated family discussion. Streaming music is great as well with the ability to connect to any Bluetooth device in connection range. The Dots are small and hardly noticeable and the voice recognition is pretty good considering all the different voices in the household. Plus, the programmers have quite a sense of humor.... asking Alexa if she is related to H.A.L. still makes me chuckle. Google? whatever.... I am happy with the Echo.... just patiently (or impatiently) waiting for local support for weather and traffic reports, etc. I have had the Echo (purchased from the US) for 6 months now. It is a great addition to my emerging smart home aspirations. Now Apple (which I have supported for 22 years) is about to unveil the HomePod in hopes to grab some of the smart home speaker market. I have been thinking about a Sonos based home audio system but may have to wait a bit now.